The 2019 Chevrolet Silverado Trail Boss pickup seemingly has the goods to be all that somewhere west of Laramie, where there’s a steer-roping girl; a sassy pony going high, wide, and handsome; and every other thing Ned Jordan fantasized about long ago in one of autodom’s greatest advertisements. 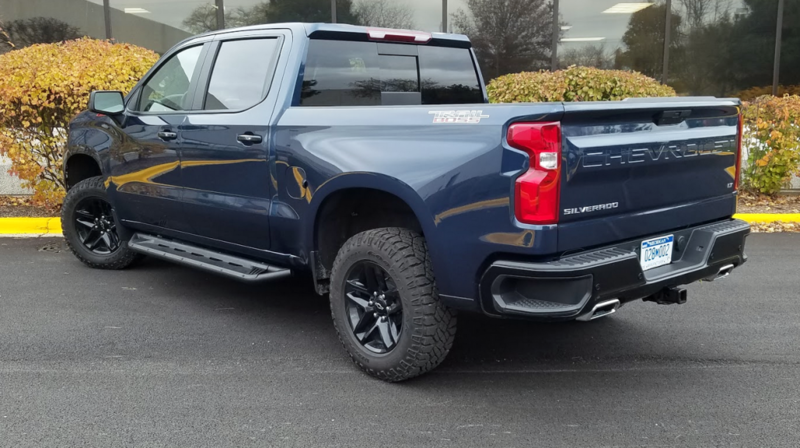 Silverado Trail Boss models look the part of their macho name–standard equipment includes a 2-inch suspension lift, skid plates, Rancho shocks, and gloss-black 18-inch aluminum wheels on Goodyear Duratrac off-road tires. Chevy has redesigned its full-size half-ton pickup line for ’19, with new styling, larger cab and cargo-bed dimensions, and a few new powerteams. 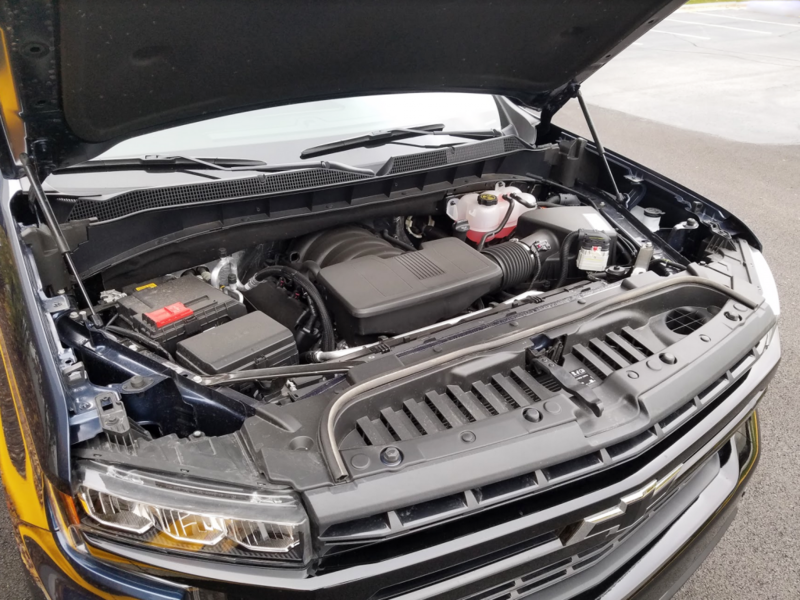 This Silverado sheds some weight—up to 450 pounds depending on the model—while sticking with a steel body structure (though hood, doors, and tailgate are aluminum). Several trim-and-equipment levels have been added too, including a pair of off-road-oriented Trail Bosses: a Custom and a plusher LT. Consumer Guide got to sample one of the latter. The cavernous cabin provides plenty of occupant space, even for plus-sized adults. Interior materials are sturdy, but a bit lacking in pizzazz–even in the LT Trail Boss, which is something of a higher-line model. The business end of any Trail Boss is its chassis with the Z71 off-road package featuring Rancho-brand monotube shock absorbers. The Boss also sports a 2-inch suspension lift for increased ground clearance and more-generous approach and departure angles, and chunky-tread 275/65R18C Goodyear Wrangler DuraTrac tires. 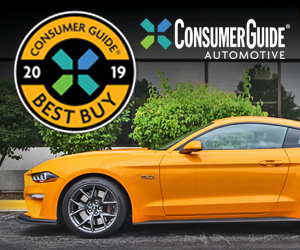 Additional features are an automatically locking rear differential, hill-descent control, heavy-duty air cleaner, undercarriage skid plates, and twin red tow hooks peeping out from the front bumper. The grille, bumpers, and alloy wheels all have a gloss-black finish. As expected, the Silverado’s cabin offers plenty of generously sized storage bins and cubbies–including novel “hidden” bins (photo at right) that are built into the rear seat backs. In addition to the Trail Boss equipment and the LT engine and trans, standard external features were a power-locking and power-releasing tailgate, cargo-bed lighting and tie-downs, twin bright-tipped exhaust outlets, a rear bumper with built-in corner steps, heated power mirrors, and full LED lighting. Interior gear not superseded or upgraded on the test vehicle by a mound of options included things like a 60/40 folding rear seat cushion, leather-wrapped steering wheel with audio controls, keyless entry and starting, Bluetooth audio streaming, Apple CarPlay/Android Auto smartphone connectivity, and a 4G LTE Wi-Fi hotspot. Z71 badges on the front fenders and Trail Boss graphics broadcast the Trail Boss’s off-road-ready bonafides. The tester’s sticker price was plumped up to $56,790 with extras like leather upholstery, heated front bucket seats with center storage console, 10-way power driver’s seat, heated steering wheel on a tilt/telescoping column, dual-zone climate control, power sliding rear window with defogger, and a spray-in cargo-bed liner. Also added were a premium Bose sound system with satellite and HD radio, and the Plus version of the Chevrolet Infotainment 3 system. Driver-assistance tech came in the form of front and rear parking assists, and lane-change, blind-zone, and rear cross-traffic alerts. Trailering aids listed a hitch-view camera, trailer tire-pressure monitor, and trailer-brake controller. Polished powertrains are a strong point of the new Silverado. The Dynamic Fuel Management 5.3 V8 in our test vehicle provided smooth, satisfying acceleration. Outfitted like this, the CG test truck masked its purposeful nature fairly well. Soft-touch material covered the upper half of the instrument panel, the broad lid of the console box, the door centers and armrests, and the tops of all four doors. Front seats were well padded for a good degree of comfort—though rear seat backs felt a little thinner. Legroom was generous in either row (the reconfigured crew cab adds three inches of rear-seat room for 2019), and three well-fed adults could find room enough across the rear seat. Headroom will be the least of any passenger’s concerns. That extra couple of inches of suspension lift made for a challenging step-in height, so the tester’s extra-cost side steps came in handy. A full complement of legible analog gauges faces the driver, with large speedometer and tachometer dials at both ends and a strip of four smaller ancillary gauges along the top of the instrument cluster. Chevy has reduced some of the instrument-panel clutter by grouping push buttons for driveline mode and lighting onto a shared pod to the left of the steering wheel. In a world gone mad for novel transmission shifters, the Silverado sticks with a lever on the steering column. Virtual buttons on the 8-inch dash screen and manual volume and tuning knobs made the audio system fairly simple to program and operate. Climate controls used handy rotary temperature and fan switches, with a closely clustered group of buttons for other settings. Personal items can be stashed in upper and lower glove boxes, and large map pockets—with cup holders—in all doors. Space in the console box is vast, and two exposed cup holders are holed up in the console. With the rear seat cushion flipped up, there’s a wide storage space on the floor. The leather package has the added treat of small-item storage incorporated into the rear seat backs. Hinged lids blend into the seat when closed. Pairs of cup holders are found in the pull-down center armrest and in the back of the center console. Endowed with 355 horsepower and 383 lb-ft of torque, the 5.3 V8 moved the tested Trail Boss swiftly and directly from a standstill. 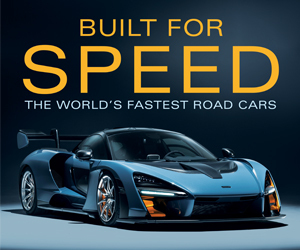 Out on that big ribbon of highway in the not-so-wide-open spaces the 8-speed automatic downshifted promptly for assured passing in urban commuting. Dynamic Fuel Management runs a complex pattern of cylinder usage—under the lightest load conditions just two pistons may be pumping away—to save gas. EPA estimates are 15 mpg in city driving, 20 on the highway, and 17 combined, and CG’s experience hewed fairly close to those projections. While general pickup-truck ride and handling has improved markedly in recent years, off-road specials like the Trail Boss surrender some ride comfort and quiet in on-road driving, thanks to “mud” tires with aggressive tread patterns. (Plus, Chevy says regular rotation of the off-road tires is “strongly recommended.”) Even with no load in back, the leaf-spring rear suspension acquitted itself pretty well on not-always-smooth surface streets. Fortunately, the new Silverado’s family tree has lots of branches. The careful truck shopper can get the right one without going out on a limb. 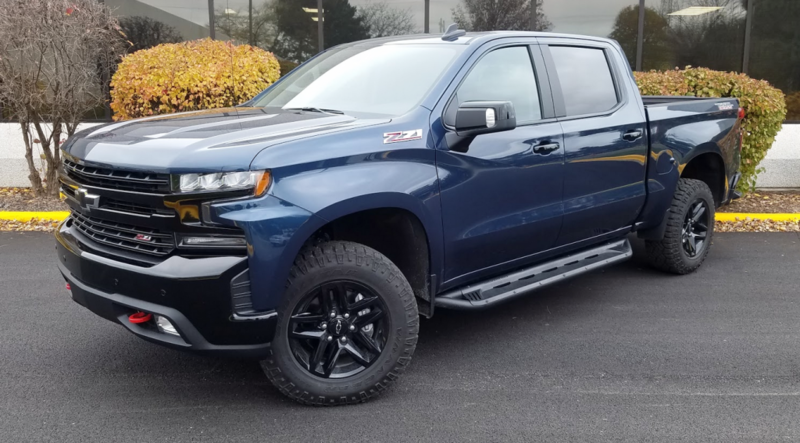 The redesigned-for-2019 Chevrolet Silverado brings plenty of worthwhile new technology/convenience features and notable improvements in all-around refinement, but should still feel pleasingly familiar to traditional pickup buyers. Written by: The Daily Drive staff on November 15, 2018.on February 1, 2019.